Location of Sighting: Along Highway 54, Manila, Philippines. A 39-year old physician (and former Artillery Officer of the U.S. Army) was traveling along Highway 54 (now EDSA) that night of 28-November 1954 when he saw what seemed to be an object that was “glowing in orange light” on the southern part of the sky. At this point, the observer (witness) had the car (which was chauffeur driven) stopped for him to take a better look at the approaching object as it moved among the background of high scattered clouds.. The witness had observed the object moving on a northerly course for about 3 minutes before it “stopped”, while simultaneously rising in altitude from 30o to 45o in the process. Now the object has moved itself some 8,000 feet away from the witness. The object was described to be circular in shape, with a dome-shaped top and the bottom is flat. 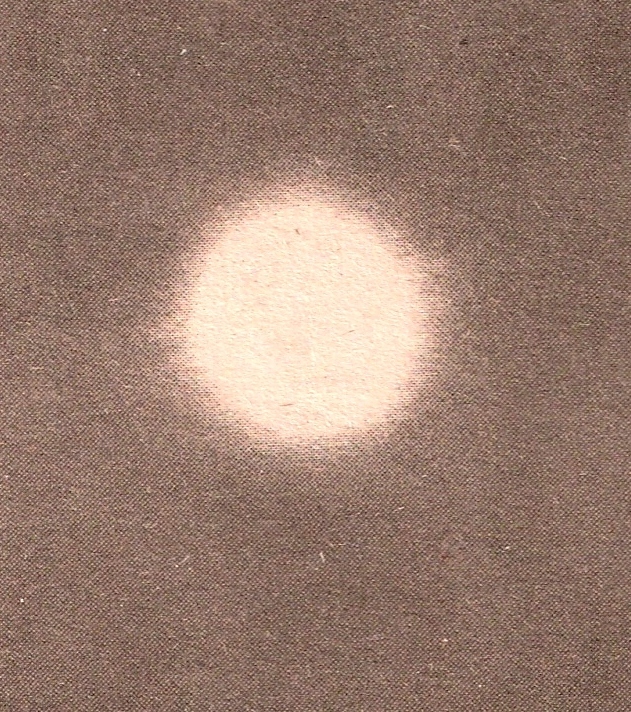 It was glowing with a bright orange color, and had 4 evenly-spaced “yellow discs” (or what appeared to be like “portholes” with yellow light coming through) on the sides, with a portion of the 5th disc partly visible towards the side (this gives an impression that the object may have such “portholes” around it). (The chauffeur was said to have only caught sight of the object as it moved away). Thomas M. Olson (ed. ), The Reference for Outstanding UFO Sighting Reports (Riderwood, MD: UFO Information Retrieval Center, Inc. 1961). Dennis Stacy & Patrick Huyghe, ©2000,“The Field Guide to UFOs: A Classification of Various Unidentified Aerial Phenomena Based on Eyewitness Accounts” (HarperCollins Publishers Inc, New York). Photographs of a purported anomalous aerial phenomenon (UFO) that was observed in the western sky over Manila Bay at around 7:30 in the evening taken by a photo-journalist, ERNIE SARMIENTO of the local tabloid, People's Tonight Journal., published on 30-September 1986. Photo (at top left) was taken while the object was reportedly "exuding various colors of light", then (top right) as the object started moving out of view. The photos were taken with a Nikon 50 - 300 mm zoom lens with a speed of 1/15 of a second at full aperture on a Kodak Tri-X film. Location of Sighting: Manila Observatory, Quezon City, Philippines. Shape of objects: "Tear-shaped"/ spherical front. "I was on the observation deck of the Manila Observatory where I had a completely unobstructed view of the mountain ranges to the east. . ."
". . .I had followed the rising of the moon and was in deep in my thoughts recalling the lecture attended earlier in the day when suddenly there appeared the beautiful sight. . !" A letter of inquiry posted by this Investigator was positively responded to by the late FR. FRANCIS HEYDEN, SJ, the only solar physicist in the country at the time. I was walking in our newly bought land at the province when suddenly i caughta glimpse at a mysterious saucer-like object in the sky. at first i thought it was only a remote controlled plane or disk but upon looking at it seroiusly, it looked more like a saucer. it glows but not that bright and its fast!! We were preparing for NOCHE BUENA in preparation for New Year 2007. I noticed this red shaped object (size of a small planet like Mars) about south-east of the full moon. It was clear although there was some clouds which at times cover the moon. The sky was well lit with fireworks display since it was countdown to New Year. Initially I thought it was Mars but noticed that the object was contant and there was no flickering. I noticed the object moving into a slow speed going North. It took quite some time but the speed was constant and it was straight until it disappeared into the horizon. By that time, my wife's cousing was with me watching the whole thing. I thought it was a plane of sort but later ((name deleted)) (wife's cousin) came inside and claimed that the red object had reappeared and heading into the same position at the same slow constant speed. We watched it until it took the same position as last time and stayed there for quite awhile until it again sped off into the distance at the same slow constant speed. It reappeared the second time. This time my aunt and wife were with us. It performed the same exercise. The third time, by then it was already 1:00 AM, January 1, 2007, it reappeared and followed the same path and position. But this time, it was joined by a second smaller red object which flew parrallel its original route. The bigger object then started speeding into the distance at the same constant speed while the smaller red object reached a point parrallel to the original location of the bigger object. By this time, the bigger object had already disappeared the smaller object started to follow it, at the same slow constant speed. I went up to the balcony to follow its route until it finally disappeared. Time was around 2:00AM. I noticed that at one point the entire street lamps along our house concked out for a full three seconds before it reappeared. But no brownout occured. Perhaps the UFO was watching the fireworks display and perhaps it was thinking that it could not be seen because it was a red dot in the sky. I tried to take pictures of it with my sony W50 digital camera but I am not sure if anything came out of it. I have the file and can send it to you. Have not touched it really as I am not adept with any software relating to photography. 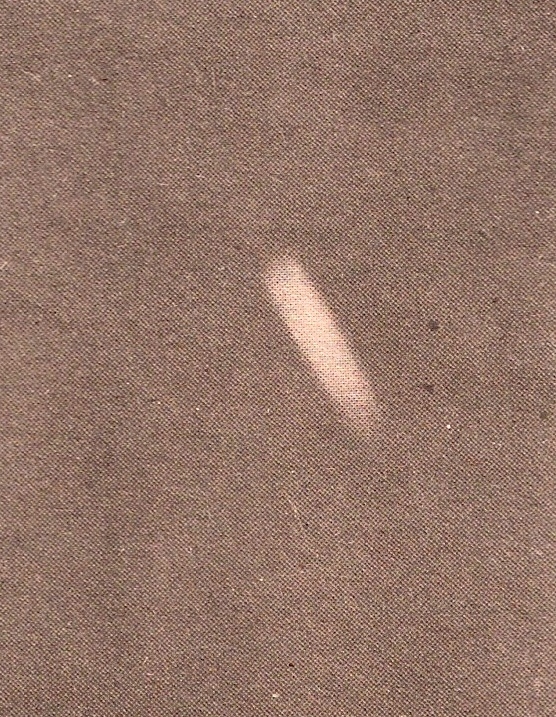 Copies of the photographs taken of the alleged anomalous object were shown to Field Investigator Edwin Gatia by astronomers at PAGASA Observatory at the University of the Philippines campus in Diliman, Q.C., where they were submitted by the photographer, a HERNAN CARTAGENA who was a resident of Aurora Blvd.,Quezon City. Location of Sighting: Magallanes Bridge, Manila, Philippines. "I was on a bus when I saw a metallic spherical object floating in the sky. It looks stationary and was just about at the side of a building. When the bus got to the bridge the object was covered from sight by the building.